The Sabine War, known in history more as “The Battle for the Abducted Sabine Women” – refers to the legendary period of Roman history. According to the stories of Roman historians, Rome was inhabited only by men; neighboring tribes did not want to extradite their daughters to the poor population of Rome. Then Romulus arranged a holiday of Consulars and invited neighbors. Those came with their families. During the holiday, the Romans suddenly rushed to the unarmed and kidnapped their girls. Indignant neighbors started the war. The Romans defeated the Latins who attacked Rome. Much more difficult was the war with the Sabines, who lost a lot of women. With the help of the daughter of the captain of Capitol, Tarpei, the Sabines took possession of the Capitol. The struggle lasted a very long time. Sabine under the command of King Titus Tatsiya finally defeated the Romans and turned them into flight. Romulus appealed to the gods and promised to build a temple to Jupiter Stator if he stopped the fleeing ones. At this decisive moment Sabine women, already attached to their husbands, with her hair loose and in torn clothes, rushed between the fighters and begged them to stop the battle. Also, the Sabine women, in the hope of stopping the battle, brought their young children to the battlefield. The central female character of the painting by Jacques Louis David is Sabine’s Gercilia, the wife of Romulus, who was previously kidnapped by him. Hercilia stood between her father and her husband Romulus, who had already brought a spear, trying to hit the enemy. The Sabines agreed with the entreaties of the abducted Sabine women who became the wives of the Romans, and then the eternal peace was concluded, according to which two peoples were united in one state under the supreme primacy of Titus Tatsia and Romulus; The Romans were supposed to wear, in addition to their own name, the Sabine name kvirita; religion became common. Thus, women saved Rome; in remembrance of this Romulus established the feast of the Maturalia and gave women many honorary rights. 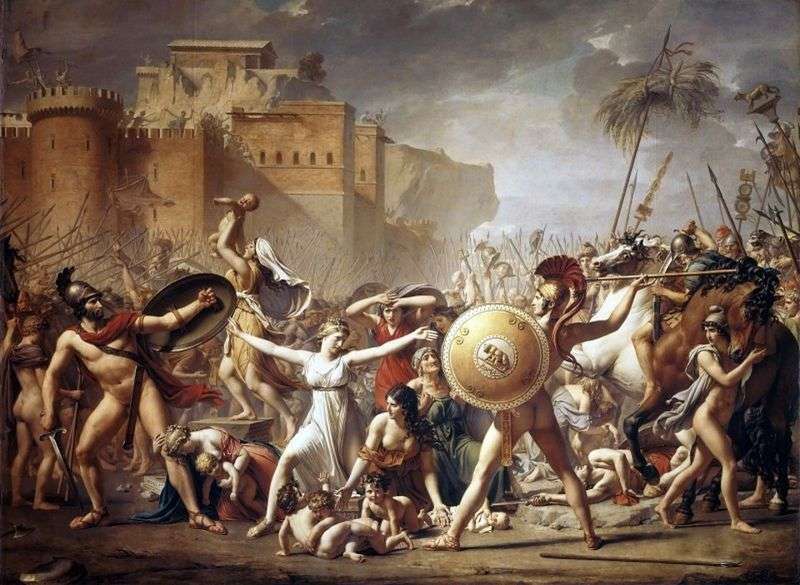 Description and meaning of the painting Sabine women who stop the battle by Jacques Louis David.